Well, I told you about LouLou’s Boutique on the West Side rebranding a few weeks ago, and now, I’m officially obsessed. The store now features a whole new, fresh and crisp look, with new fall styles to boot (no pun intended!). Nancy, the owner, is also welcoming in some new brands through trunk shows. The one I’m SUPER excited about is the one they have coming up on October 12. Nancy is bringing in Chloe & Isabel jewelry, which I recently found out about and it’s GORGEOUS! Also, Lur Apparel, which is locally based and eco-friendly! Click here to read the story we did on them earlier this year! Cincy Chic also did an “Eco Fab” fashion show with Lur Apparel last year — click here to check out the highlight video of that show! Below is a flyer for the trunk show so you can mark your calendar (and make room in your closet!) 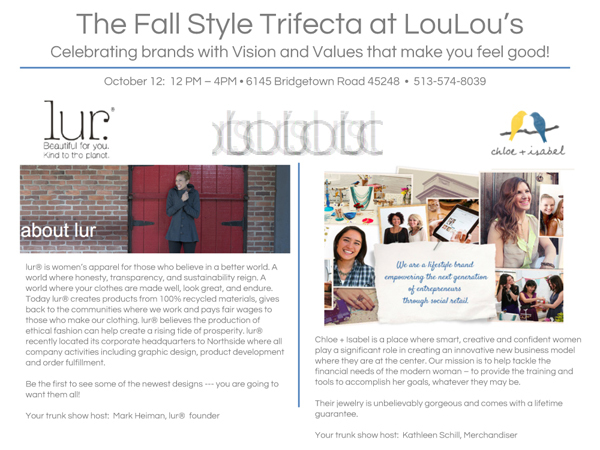 Click here to “like” LouLou’s on Facebook and learn more about the trunk show!